Gov. Ned Lamont conceded Tuesday that he won’t secure one of the most controversial concessions he’s seeking from employee unions — new limits on cost-of-living adjustments to pensions —this spring. The Democratic governor said he still hopes to secure this giveback at some point, but added it’s unlikely to happen before legislators adopt the next, two-year state budget. Lawmakers are striving to adopt a new plan before the session ends on June 5. 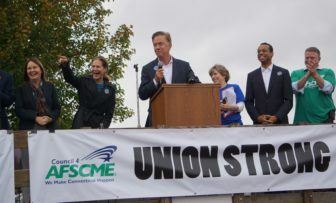 Lamont, who spoke with reporters following a business visit and press conference Tuesday morning in East Windsor, said he is optimistic that labor talks will bear other fruit. The governor wants to reduce labor-related health care costs by $185 million over the coming biennium. He also wants labor’s permission to shift billions of dollars of surging pension costs onto a new generation of taxpayers between 2033 and 2047. But what about restricting the cost-of-living adjustments that increase the value of some state pensions each year? “I think that’ll take a little longer,” he said. According to the governor’s budget office, the COLA changes Lamont seeks would save $26 million in the General Fund and Special Transportation Fund combined next fiscal year, and $28.6 million in 2020-21. The State Employees Bargaining Agent Coalition, which is comprised of most major state worker unions, drew a line of opposition in the sand when it came to the COLA changes back on Feb. 19, one day before Lamont unveiled his first budget proposal. “To be clear: we will not be part of asking for still more sacrifices from state employees, who have already given so much for the people they serve,” SEBAC wrote in a statement. Unionized state employees granted concessions in 2009, 2011 and 2017. The latter agreement, which extends for four years, remains in effect. Union leaders have argued increasingly in recent years for legislators to consider raising taxes on wealthy households and major corporations as an alternative means to cover Connecticut’s surging pension and other debt costs. Lamont has said the COLA issue must be addressed eventually to mitigate Connecticut’s huge, funded pension liabilities, and added Tuesday he has not abandoned his goal of reform in this area. “We share the governor’s optimism that these win-win discussions are going to continue yielding savings for the taxpayers, now and into the future,” Larry Dorman, spokesman for Council 4 of the American Federation of State, County and Municipal Employees, the largest state employees’ union, said Tuesday.